“It is shocking and disheartening that someone I admired would do this,” a former federal prosecutor said. 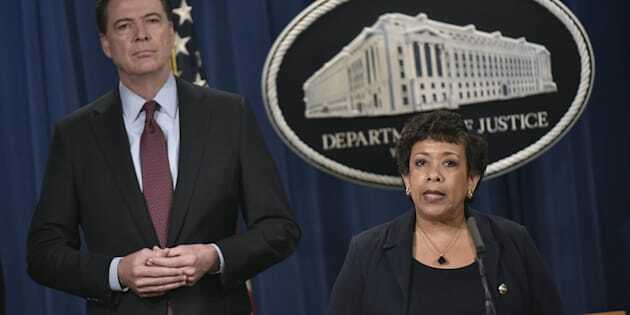 FBI Director James Comey, left, stands alongside&nbsp;Attorney General Loretta Lynch during a press conference at the Department of Justice on March 24, 2016. FBI Director James Comey, left, stands alongside Attorney General Loretta Lynch during a press conference at the Department of Justice on March 24, 2016. WASHINGTON ― FBI Director James Comey’s unprecedented decision to insert the bureau into the presidential campaign less than two weeks from Election Day has caused a rift in federal law enforcement. Attorney General Loretta Lynch wanted Comey to follow DOJ protocols and traditions and not reveal the discovery of new emails that might be pertinent to Clinton’s case, The Huffington Post was able to confirm on Saturday, following the account of a Justice Department official in The Washington Post. Indeed, some former federal prosecutors believe that based on his previous statements, Comey was required to follow up with Congress. Solomon Wisenberg, a former federal prosecutor who served as deputy independent counsel in the investigation of the Monica Lewinsky scandal, argues that Comey made a mistake in July when, in an announcement that the DOJ was not pressing charges, he criticized Clinton’s behavior and subsequently testified that he would re-open the investigation if new information warranted it. In so doing, Comey obligated himself to keep Congress up to date, argued Wisenberg. “His duty was to shut up and he didn’t. If you want to talk about violating protocol, he has provided a roadmap,” he said. Having made that error, Comey was likely obligated to inform Congress about the discovery of the new emails, according to Wisenberg, who is now a white-collar criminal defense attorney. Werner-Simon maintains, however, that if Comey felt obligated to provide Congress with piecemeal updates about the investigation, he should have been less equivocal about the implications of his findings.